I would like to say a few words about the up-coming Master Gardener Class offered by Coconino Country Extension. It can be a life-changing experience because it is about more than insects, drought-tolerant plants, tomatoes, and compost. Under-girding it all is a profound change in the way gardeners, and everyone else for the matter, should look at things, a shift in what Emmanuel Kant called a Weltanshauung, a world-view. I'm sure that Hattie Braun, the Grand Impresario of the Master Gardener Extravaganza, would eschew any claim to philosophical, much less theological, acumen. As a confirmed and knowledgeable horticulturalist, her focus is on the furrow, as well it should be, and not on the stars. There it is. One cannot fight the natural process. As a boy in Sunday School, I often learned it and just as often forgot it. Thomas à Kempis said it simply, "Homo proponit, sed Deus disponit " (Man proposes, but God disposes.) God's will is not something to be commanded as the natural process illustrates and politicians and preachers often forget. 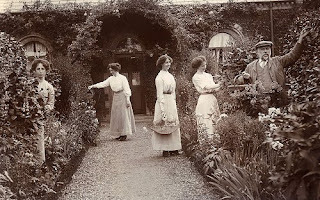 In gardening, the human tendency, filled with hubris, wants to take charge, and do with nature as it wills. Humans want to plant things they like, unaware that the real question is not what they like, but what works. The Master Gardener Class is about what works, pragmatic gardening. In the High Country not everything that works elsewhere works here. 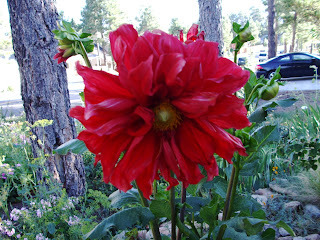 As we have all heard over and over and ad ridiculum, the weather and the soil in Flagstaff aren't as congenial to gardening as they are in San Diego, Tulsa, or Annapolis. So what? Enough kvetching already. The big message, which bears repeating, is that successful gardening requires cooperation with nature. No one anywhere ever got anyplace trying to command the will of God. Easier said than done. Oddly, it takes knowledge to cooperate with nature. Just sticking plants in the ground doesn't work. Successful gardening requires knowledge of soil, plants, water, weather, and fertilizer. The knowledge has to be specific to locale and plants as well. The specificity of the locale doesn't mean just Flagstaff. It refers to micro-climates, specific zones, such as the shady side of a house or the bottom of a slope as distinct from the top. 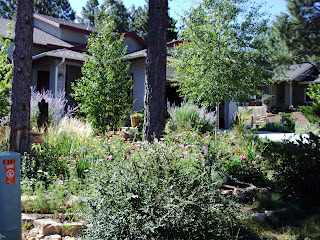 Gardening begins with soil, and the soil around Flagstaff is great for ponderosa pine and native plants and grasses. If anyone wants to move beyond those, even with adaptable plants, the soil has to be amended. The Master Gardening Class devotes time in how to amend the soil to make it more congenial to plants other than natives. The key element in the right kind of soil is compost. Compost can be store-bought or home made. As with most things, home made is best. Part of the course deals with the recipes and cooking times for home made. Which brings us to fertilizer. Not all fertilizer fertilizes the right way. Tomatoes don't want the same kind of fertilizer as lettuce, grasses, of onions. Even though the soil may have been amended to make it plant- friendly, the right kinds of plants and seeds have to be chosen. For instance, while an heirloom Brandywine tomato may be grown here, its fruit will not mature fast enough here to produce edible tomatoes. 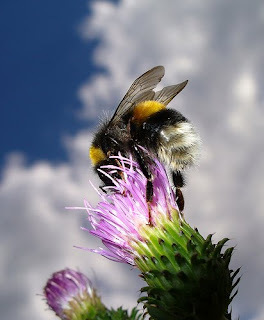 Artichokes can be grown here, but don't expect a bumper crop although the colorful thistles are worth the effort. There are lots of other topics: good and bad insects, fruit trees, vegetables, flowers, and bulbs. Water conservation is a big Yes, Yes. The key element is, of course, the Grand Impresario, Hattie Braun. She knows her stuff. She relishes horticulture, and she brings in a collection of experienced gardeners and horticulturalists who know how to garden in the High Country. The class which meets once a week for 15 weeks is a pleasurable experience, and if one doesn't resist the inevitable, it can be a life-changing experience. The up-coming series of classes begin Tuesday, February 2, from 1-4:30 p.m. at the East Flagstaff Public Library's Community Room. Hattie can be reached at (928) 774-1868, x17, or at hbraun@cals.arizona.edu. Excellent article, you are an accomplished wordsmith.